Richard Stephens/Special to the Pahrump Valley Times Junior guard Fabian Perez gets fouled driving to the basket during Beatty's 58-52 win over Word of Life on Jan. 29 in Beatty. Richard Stephens/Special to the Pahrump Valley Times Senior Jacob Henry finished with 11 points and 12 rebounds during Beatty's 58-52 overtime win over Word of Life on Jan. 29 in Pahrump. Richard Stephens/Special to the Pahrump Valley Times Beatty's Jorge Leon joined three teammates in double-figures by scoring 10 points during an overtime win over Word of Life on Jan. 29. Richard Stephens/Special to the Pahrump Valley Times Beatty junior Fabian Perez led the Hornets with 13 points during a key Class 1A Southern League victory over Word of Life on Jan. 29 in Beatty. Two weeks after a dramatic 63-62 victory over Spring Mountain that remains the Golden Eagles’ only league loss, the Hornets had four players score in double figures and went overtime to hand Word of Life its first league loss, 58-52 on Jan. 29 in Beatty. The overtime was all Beatty, which scored the first 8 points of the extra session. Alan Sandoval found Jacob Henry down low for a layup, then was on the receiving end of a similar pass from Jorge Leon. Brayden Lynn scored on a putback, and Fabian Perez then took a steal all the way for another layup and a 56-48 edge with 1:40 left. A couple of nice drives to the basket made it closer, but Sandoval finished it off, hitting a third-chance putback to cap the scoring. 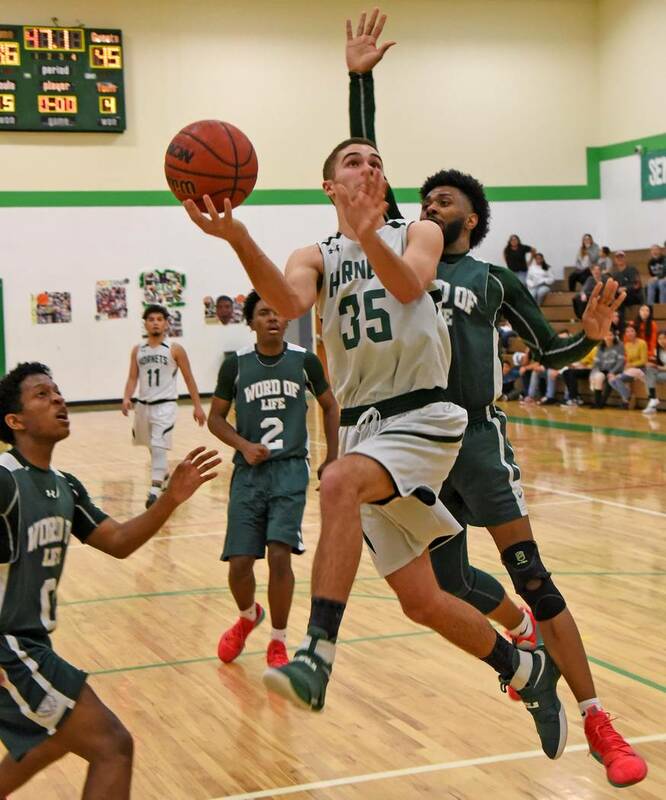 That balance was the key for the Hornets, who clearly took to heart coach Steve Sullivan’s message about sharing the basketball following a brutal 59-40 loss to Beaver Dam. Against Word of Life, Perez led the way with 13 points, Sandoval and Henry each netted 11, and Leon tallied 10. Each team had moments when it looked as if it could put away the other. Word of Life went on a 12-4 run early in the second quarter to take a 20-13 lead. 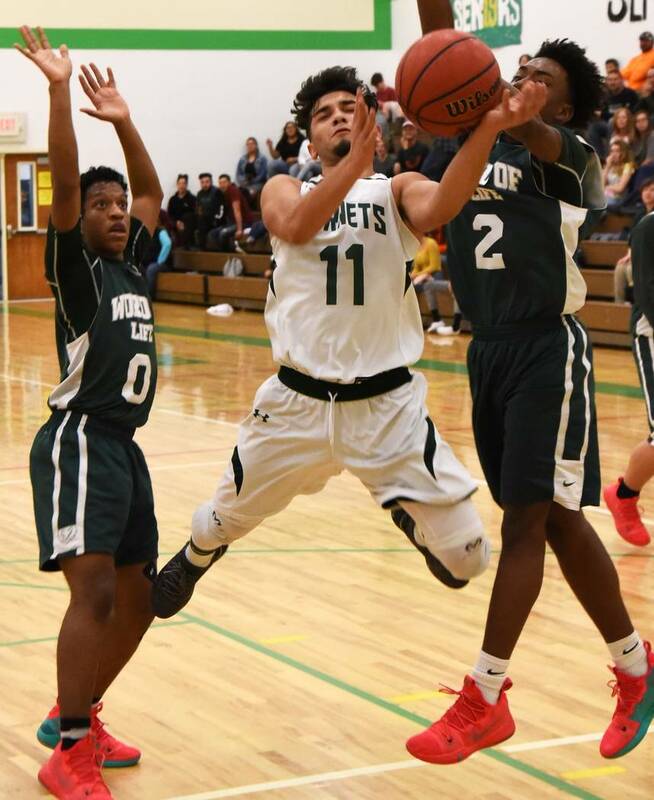 But the Hornets started working the ball inside, sometimes for layups, sometimes on drives, and when Leon was fouled as he was starting a drive and sank both free throws with 29 seconds to go in the half, Beatty held a 27-20 lead. But the Eagles bounced back after that 14-0 Hornets run, and spent the third quarter slowly chipping away. They scored the last 7 points to pull within 36-34, with a couple of turnovers — the Hornets finished with 21 — fueling the small run. “Based on what we’ve seen from them on film, they like to slow things down because they don’t have a deep bench,” Sullivan said of the Eagles. “Our objective was let’s make it a full-court game, let’s keep the pressure on them. Even with the lead toward the end, when it was getting tight, I just felt Word of Life was tired, at least more tired than we were. The fourth quarter saw another trade of runs, with Beatty scoring 7 consecutive points — 4 on layups by Henry after nice feeds from Sandoval, who led the Hornets with 6 assists — and Word of Life answering with 6 straight, all inside. A Perez free throw and a Sandoval putback gave Beatty a 48-45 lead with 44 seconds left, but Jaiden Stuckey, who led the Eagles with 17 points, nailed a 3-pointer 23 seconds later to force overtime. 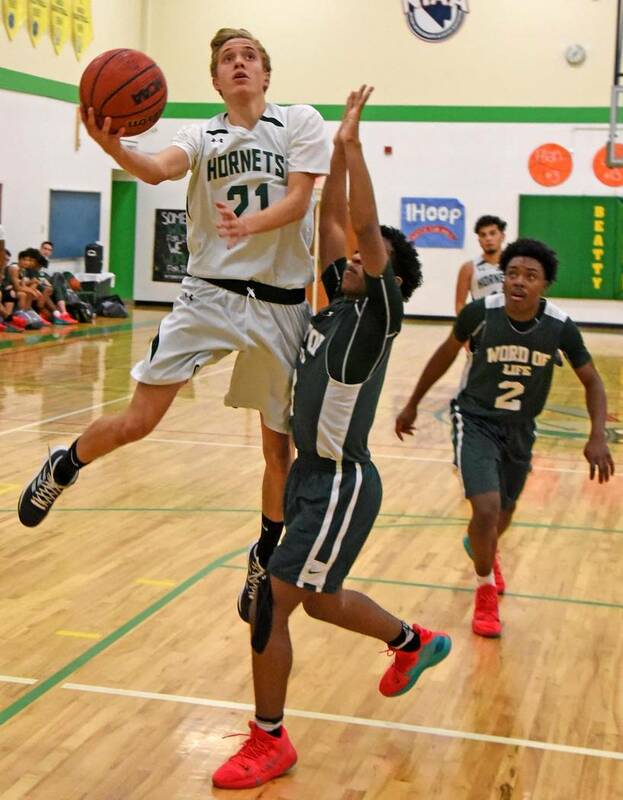 With wins over the top two teams in the Class 1A Southern League standings under their belts, the Hornets welcomed last-place Green Valley Christian to town Friday night. There were no such dramatics this time, as Henry scored 16 points and Sandoval totaled 11 in an easy 51-33 win.